If it’s time to refresh your beading supplies, check out this collection. The editors of Beadwork hand-selected every item, so all you have to do is focus on enjoying your next projects. Could you use some new supplies for your upcoming projects? The Editor's Favorite Supplies Collection features a book, magazine, eBook, and four tools that are sure to jump-start your creativity. Whether you're an aspiring beader or avid bead artist, you'll love this assortment of great resources. This special collection is full of helpful information and top-notch materials, all handpicked by the editors of Beadwork. Learn the ins and outs of seed-beading from Dustin Wedekind's Getting Started with Seed Beads then dive into the new issue of Quick + Easy Beadwork, where you'll find plenty of incredible designs to create. You'll also discover information about beading and stringing with helpful tables, charts, and diagrams in The New Beader's Companion. With a retail value of $103, receive this kit for only $49.99! Author Dustin Wedekind takes readers through the process of working with seed beads, from shopping and storing to stitching a successful first project. This classic, must-have resource includes beginner instruction on all the traditional stitches, including backstitch, brick stitch, square stitch, flat and tubular peyote stitch, netting, herringbone stitch, and right-angle weave. Quick + Easy Beadwork is a project-packed, special issue devoted to everyday, wearable beaded jewelry that can be made in a few hours or less! Novices will find popular bracelet, necklace, and earring projects, and beading pros will love how quickly they can create any of these stylish designs. The Beader's Companion has long been an essential tool in every beader's toolbox and is now offered in an expanded and updated eBook. No beader will want to be without this excellent resource. 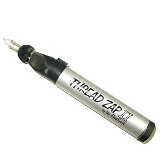 The Bead On It Board will soon become your new favorite tool. This tool will make you a happy beader, with a skid-resistant base, a surface specially designed for seed beads, and raised borders to keep beads from wandering off. 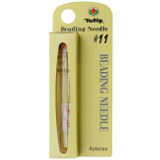 These beading needles are perfect for bead stitching and bead embroidery. Their special engineering makes them less likely to split your thread and they pass through Japanese size 15° seed beads with ease. 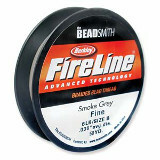 FireLine braided polyethylene beading thread is one of the strongest fibers per diameter available. It's also extremely flexible and won't break when used with sharp beads.